This truly is how my luck goes... I'm loading the bandit so I'm not rushing around tomorrow to get to the bike ride. I go to lock the doors after closing the trunk, and nothing. Well, I shouldn't say nothing, the driver's door locked. Everything else says open. I figure I must have hit something in the truck knocking off the main power wire or something. No such luck. I go to the passenger door, and it activated the vacuum pump. Looks like I'm back where I started when I first got the car. Using the passenger door to unlock it. Ugh. My 80q does this too... Haven't figured out if it's the tumbler or something else since it's not my daily. I feel your pain. The messed up part is the next day it worked fine... I really don't know what happened! Did you forget to say "Simon says"? First thing, yes, none of my pics work. I'm working in getting my photos hosted somewhere else, as I'm not willing to pay $400 to host them. So it has been a while, and maybe that's a good thing. The car has been running quite well for a while now with no real hiccups. About a week ago I tried to once again put my daughter in the car, and it wouldn't start. Not only that, it back fired pretty bad. I honestly thought I might have blown up the exhaust. The next day after talking about it with Eric, the car starts and runs fine... Still not totally sure what happened. I guess it's possible the car dislikes my daughter as much as she it haha. Anyways, on to the better stuff. With everything going in lately, Eric has managed to get the car to not knock, and AFR's to be very good the whole way through the RPM range even on a fully heat soaked engine on a hot day. I still need to make up heat shielding and replace the motor mount insert though. Hopefully I can do that this coming weekend if Georges garage is free. With everything looking good at 18psi, we are looking at turning up the boost to 20psi. I'm still using a K24, and was told I should be good to about 23psi. I wanted to see what others think about this. 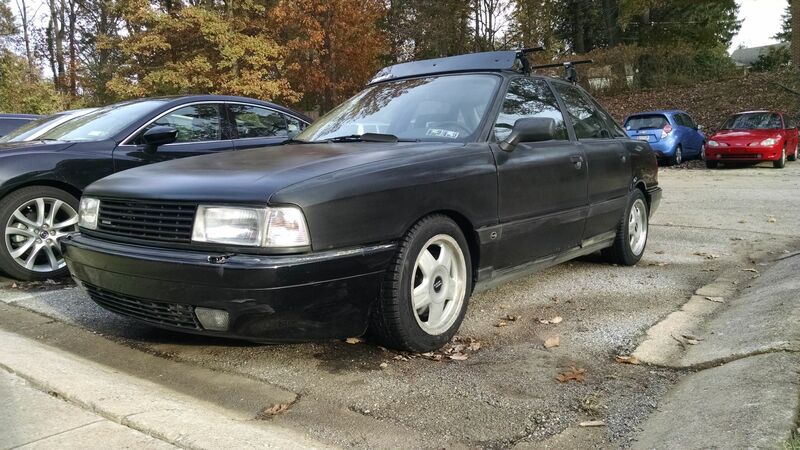 Seems like a solid # and the turbo seems healthy enough. I have a tune file ready to go for this as well. Let me know what you guys think. Went to do an oil change today, and it took much longer than I ever expected. It finally happened! The plug would not move in the 7A pan. I was using a 6 point socket on it, and it stripped! I couldn't believe it! Had to put vise grips on it, and beat them with a hammer to finally come loose. 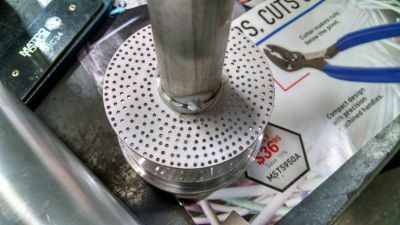 I inspected the threads, and they look great, on both the plug and the pan. I was warned about this happening with the large thread aluminum pans though. I'm glad I had a spare plug in the tool box! 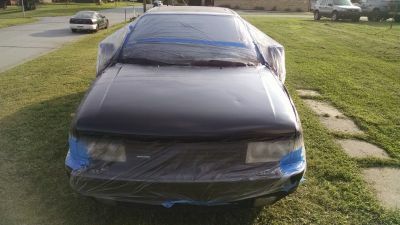 I then did the primer and paint. Came out pretty well for a non painter like myself. There is some tiger striping, but honestly, look at the rest of the car haha. Winter is fast approaching! I thought it would be nice to be able to drive this thing in the snow this year... So, as I had planned to do last year, I now have a new set of winter meats to put on. These are Nexen winSpikes, which get really good reviews. Hopefully I'll be able to got some winter time shenanigans in this year! 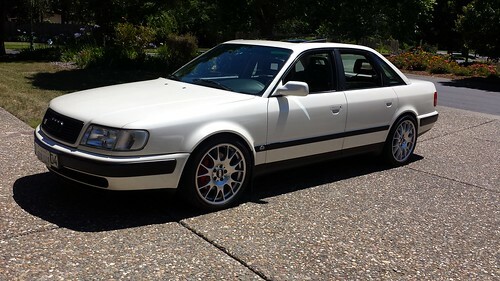 They were handed over to a friend of mine with the old Ronal 15' wheels to mount and balance. Should be some fun times ahead! Picked up my snowies on Friday, all mounted balanced and ready to go! Winter mode is now engaged! I'm looking forward to some winter time shenanigans! Always loved those wheels on the small chassis cars. Looking forward to some hooning vids in snowy parking lots or ski hill roads. 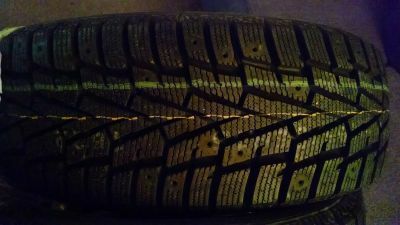 I'm running 35psi on all 4 corners, and these snow tires look low on pressure to me. 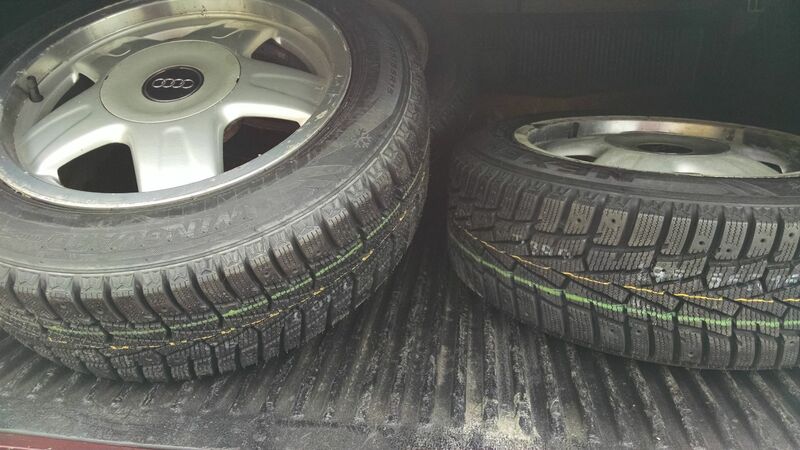 I'm also used to performance tires, so that could be the problem. Because of this, I have decided to build a pretty basic oil catch can setup. The tank was originally built with another purpose in mind, but with some modification, should work really well as a catch can. 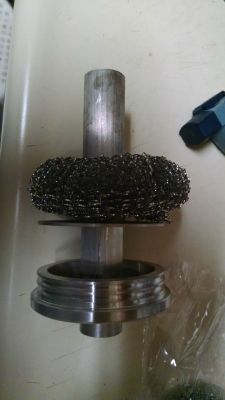 I picked up some stainless scouring pads to use as a filter below the perforated plate. It will be safety wired to the plate to keep it in place. Nice that looks like it will be a nice setup. As of now, it is being put directly into the intake track, so pretty much anything will be better. Unfortunately, the can I made is too tall for where I want to put it. I will either have to mount it on the DS behind the radiator, or make up something different for the PS. I always forget how little room I have on that side. I had to shorten mine too. 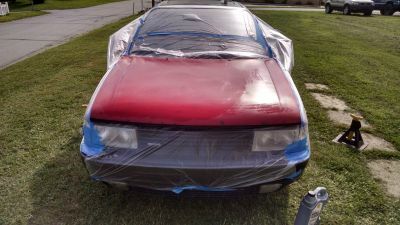 The last car I had done one in (4000) I put it behind the radiator between the brake master cyl and coolant expansion tank. It is tight back there by the firewall . I am running that breather puck that marc sells , that goes into the block . That nice CNC piece has a packing in it and maybe would help to knock out some of the liquid on its way out before it gets to the catch can. I saw those when they were being produced, pretty nice piece. The only problem I have with mounting the catch can on the DS is that being a 10v, everything else is on the PS. I would have to run so quite long breather hoses. id be a bit concerned about that catch can freezing up and blocking the venting if you are getting cold anything like we are. Things are freezing shut around here that you would never expect. I saw a wood stove chimney on my road with icicles hanging off it while it was burning this morning. dana wrote: id be a bit concerned about that catch can freezing up and blocking the venting if you are getting cold anything like we are. Things are freezing shut around here that you would never expect. This is something I have thought about. We have been getting to around 5° with this week hitting around -20° wind chill. I'm sure it has been much colder up there, as Eric has told me about -10° before wind chill in Mass. Freezing anything under the hood is not a good thing. Definitely things to think about. I'm not a fan of the crap getting g into my intake track, but would probably be better that than no breather system. What about wrapping it with tubing that has coolant flowing through? May be a pain but it would stay warm. 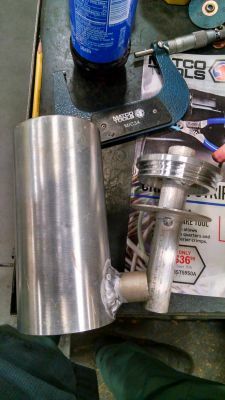 What about finding a diesel fuel filter heating element to place inside the catch can? You could wire it up to a manual switch, or relay it to a thermostatic switch. ringbearer- That was something I was looking at. It would be a PITA to wrap tubing, but it would do the trick once the engine was warmed up. Nateflix56- That is definitely interesting. I'm thinking it would be a bit large, and probably overkill, to keep a small catch can warm. Something else I was looking at was an industrial strip heater. 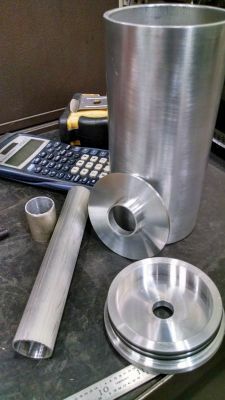 We use them in a lot of the electric motors we rebuild that are used in the elements. It wouldn't be "hot" but would make things warm up enough to not be frozen. I talked to a couple of the mechanics at work, and there are versions of them that run off of 12v, so it would be a possibility. Do you have a block and or coolant heater? We get much colder around here routinely, and a frozen cc is pretty rare. There's got to be a simple fix that hasn't been broached just yet... I'd like to think. Also, if there's a way you could mount on the passenger side as high up as possible on the firewall that would be the ticket. 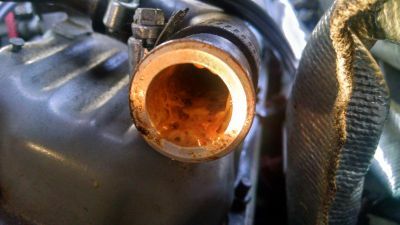 The exhaust heat would help keep it at a good temp to make sure any moisture is emulsified and doesn't freeze. Where are my anti-lag videos? I spent this last weekend up in CT getting the 3" turbo back exhaust built and installed on the bandit. It was an interesting precess, but it worked out well in the end. Lots of cutting, fitting and welding turned a lot of straight pipe and a couple bends into an amazingly quiet exhaust. 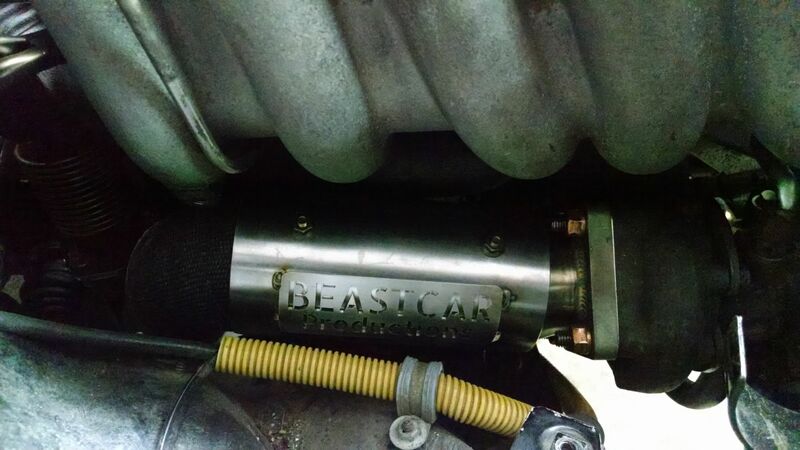 Here is the downpipe, this was the first 3" 10vt downpipe Tim had ever built, so it was quite a bit of trial and error. This was the final test fit before the WG was welded on. It's quite tight in there. Here is the final install of the downpipe. All wrapped up and air gap heat shield installed. Here is the section from the downpipe to the rear subframe. The is a vibrant resonator and half of a borla muffler. The entire borla muffler was too large to fit where we wanted it, so we cut it and recapped the end. And, due to having to leave in a hurry, I forget to take a finished pic of the rear muffler... Here is one while time was welding it. 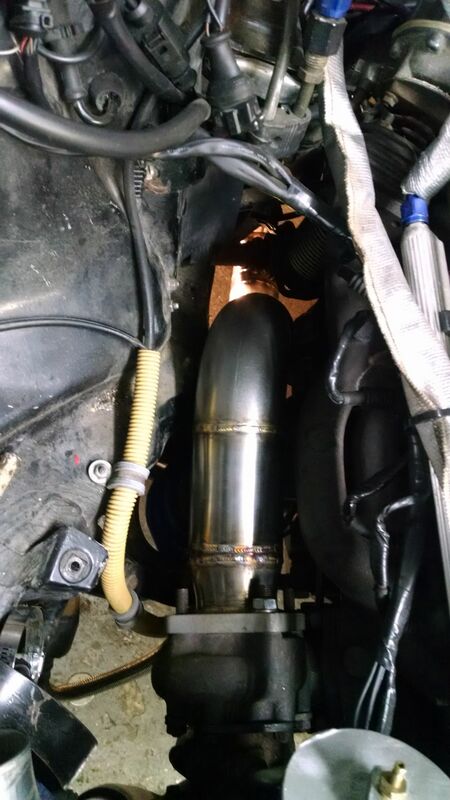 It's a dual 2.5" in/out "X" magnaflow muffler. Tim made an awesome 3" to dual 2.5" "Y" to connect it. 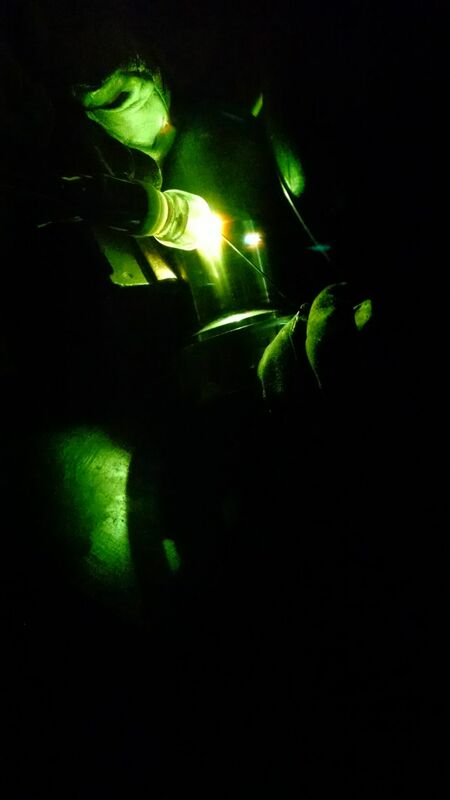 And for fun, I tried to take some pics through my welding helmet. This was the best one I got while he was welding on the rear muffler. The system sound great! It actually sound "like a turbo car"... Much different sound than the 2.5" system had, and amazingly quiet when on the highway. I can't thank Tim enough for figuring this system out! Last edited by DE80q on Thu Jan 25, 2018 4:05 am, edited 1 time in total. That's awesome! Sounds like it was worth the time and the trip. Can you post a video so we can hear it?